Welcome to Day 27 of our Divi 100 Marathon. Keep tuning in for 100 days in a row of awesome Divi resources as we count down to the amazing release of Divi 3.0 on the final day of the series! Divi is a versatile WordPress theme, but can you use it to build a business? These Divi agencies seem to think so, and judging by their portfolios and testimonials, their clients seem to think so, too. We’ve already seen that creating premium child themes for Divi is one viable way to monetize your Divi skills, and by the end of this collection of Divi agencies, you’ll see that WordPress and Divi are more than enough to deliver professional websites for clients both large and small. The purpose of this article is to share how Divi is being used by web design professionals to help their clients, while also providing you with some inspiration for your own WordPress projects. If you want to get a better idea of what Divi can do out in the real world, these web design agencies powered by Divi are a great place to start. There are more Divi-powered web design freelancers and studios out there than could possibility fit into one article. However, this collection of Divi agencies should act as a good starting point in your research into the potential of this feature-packed WordPress theme. It really is true that no two Divi websites have to look the same, and if you check out some of these portfolios, you’ll see for yourself that this is the case. After 15 years of working in design, Mark Richmond went all in with Divi and rebranded his studio as the Divi Dojo. With an impressive portfolio, the websites created by the Divi Dojo are a great example of what this theme can do. Over the years, Divi has helped Mark build highly usable and mobile-responsive websites, thanks to the theme’s ability to turn off specific sections for mobile users. Hopefully, his wish for the ability to create layouts with more than four columns will be granted soon. You might remember Tim Strifler from the Divi Nation podcast episode 15, but if you haven’t checked out his portfolio yet, you should definitely do so. 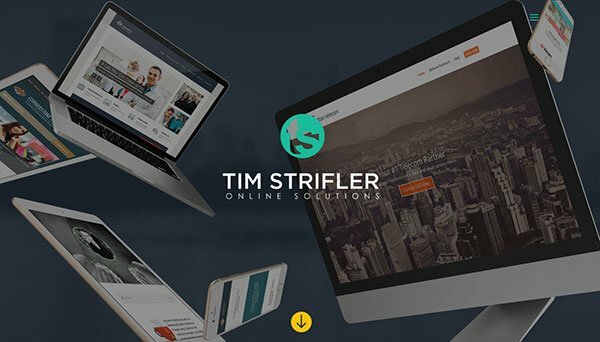 In Tim’s portfolio, you’ll find some impressive examples of the types of websites that can be created with Divi, including sites for weddings, farms, cafés, dental studios, and payment systems. These websites all make great use of the different modules of the Divi Builder and show that no two Divi-powered websites need look the same. As you might expect, Tim’s own portfolio website has been created with Divi, too. Kris Hoja runs Hog Studio out of Poland and now uses Divi almost exclusively for his client projects. After making the switch from previous Elegant Themes templates and products from ThemeForest, Kris has found that the ability to create multiple libraries of reusable content in Divi has really helped speed up his website creation process. Where necessary, Kris still uses third-party plugins like Slider Revolution to add advanced slideshows to his client projects, so he’s hoping to see a more advanced slider module added to Divi in the future. Overall, however, Divi remains a key component of his web design toolkit, thanks to the ease with which it can be used to build a range of different WordPress websites. Based in the Australian capital of Canberra, Endure Web Studios has a full portfolio that covers a wide range of different types of sites, from blogs to ecommerce stores. This helps to give Endure Web Studios one of the most varied portfolios in our collection of Divi agencies so far. The testimonials section of this Divi-powered agency website demonstrates that clients have been pleased with that they’ve received. Endure Web Studios has also found that their clients really appreciate how easy Divi makes updating their sites themselves, whether that’s adding new content or making tweaks to the design. Sarah Oates from Endure Web Studios occasionally has to work with other themes but always comes back to Divi. The ability to assemble different pieces of this theme — Lego-style — and come up with unique designs every time, is one of the main draws of Divi. As part of their workflow, Endure Web Studios is another one of these Divi agencies that use the Library feature and Global Modules for increased efficiency. The Aspen Grove Studios web design portfolio contains some great looking projects that have been built with the Divi theme. These websites cover a range of types and styles, but one thing they all have in common is that they’ve all been created using the power of Divi and its drag-and-drop page builder tool. Aspen Grove Studios has also produced a range of stylish commercial child themes for Divi. This is in addition to a number of demo layouts that can be used to quickly turn a fresh installation of Divi into something much more exciting. 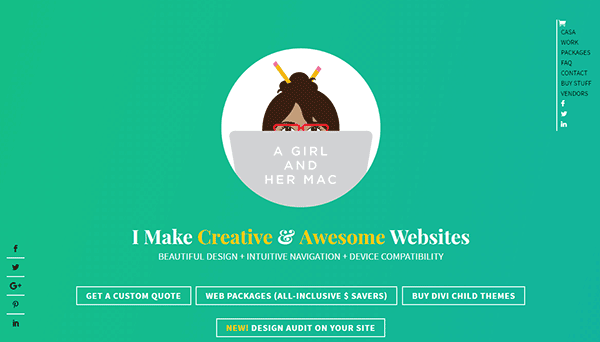 A Girl and Her Mac offers a selection of affordable Divi-powered all-inclusive web design packages, as well as a number of commercial Divi child themes. Fully custom web design jobs are an option, too. With projects completed for individuals and small-to-medium-sized businesses, the varied selection of websites in the A Girl and Her Mac portfolio really shows off what can be done with Divi. Leslie Bernal, the creative force behind A Girl and Her Mac, was an early adopter of Divi and has used it ever since its initial release. Leslie has stuck with this theme over the years as her clients find Divi easy to understand, while Leslie appreciates the intuitive interface of the Divi Builder. Ellen Kronen has been working in the field of design since 1998 so she knows a thing or two about web design and delivering solutions for clients. Through her agency, Leumesin Design, Ellen offers a number of web-related services, including fixed price website packages, site reviews and refreshes, and branding and logo services. Not surprisingly, Divi plays a prominent role in her website production toolkit. The types of sites that Ellen has created with WordPress and Divi cover ecommerce stores, membership sites, and a whole host of others. 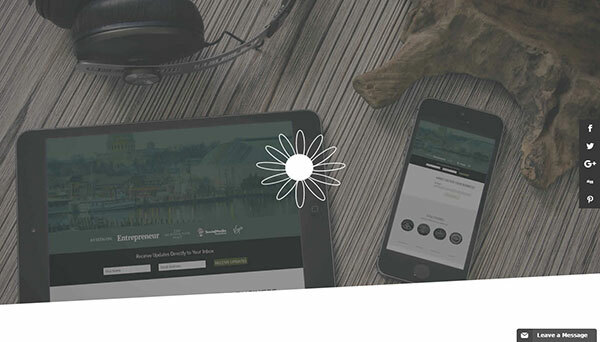 If you want to see what can be done with Divi and a healthy dose of creativity, be sure to check out the Leumesin Design portfolio. 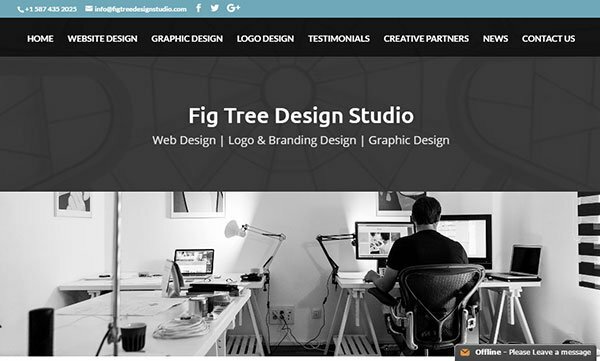 Fig Tree Design Studio is a full-service agency in Calgary, Canada, that uses Divi and WordPress as their tools of choice. 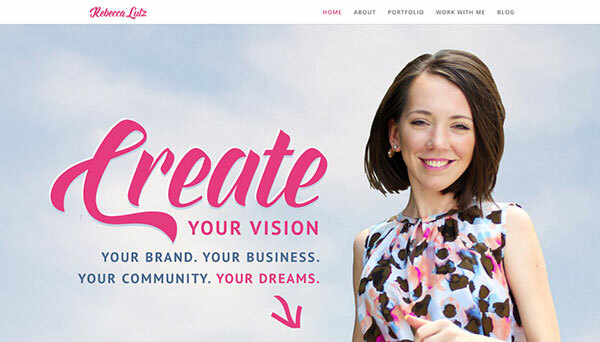 Check out the Fig Tree Design Studio portfolio to see some great examples of what happens when their eye for design is combined with the power of Divi. Wendy Alessi of Fig Tree Design Studio was already a fan of Elegant Themes before Divi came along. However, after the release of this multi-purpose theme, Wendy was hooked and now uses Divi exclusively for all of her web design projects. With a great looking portfolio and many glowing client testimonials, this approach certainly seems to be working. 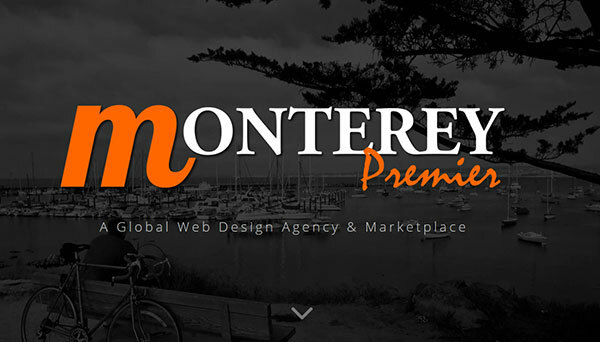 Monterey Premier is another of the increasing number of Divi agencies that also runs a theme and plugin marketplace that sells items created for use with Divi. This includes a selection of commercial Divi child themes that can easily turn your fresh Divi installation into a range of different websites. On the Monterey Premier website, you’ll also find premium Divi plugins that add new features to this already feature-packed theme. This includes a plugin to quickly white label your Divi installation, as well as a plugin that will make the Divi Builder easier to use on mobile devices – something that might come in handy if you ever need to make changes to a Divi-powered site on the go. The Design Space Co is proudly powered by Divi and even uses this fact to land more clients. The user-friendliness of Divi makes it easy for clients to take control of their site after handover, and this is used as a key selling point when discussing new projects with leads. Out of all the Divi features, Melissa Love of The Design Space Co has really embraced the Code module, which makes it easy to add HTML or shortcodes to any Divi page. She puts this module to good use, helping her create unique website designs for her clients. Although Melissa does admit that the responsiveness of Divi could be improved to handle the gray area between small laptop screens and iPads in landscape mode, she also acknowledges that the portability and time-saving abilities of Divi are hard to beat. 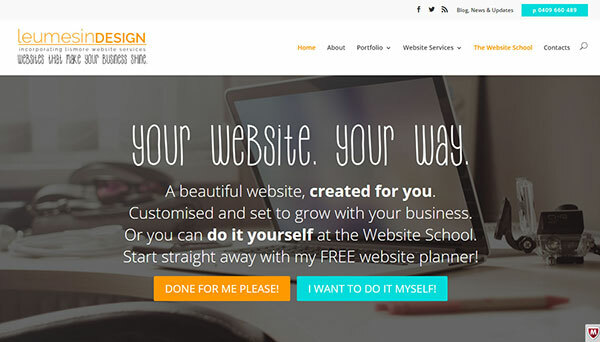 As well as using Divi to dramatically reduce project turnaround times and deliver websites within days, The Design Space Co also offers a number of premium Divi child themes for DIY website owners. 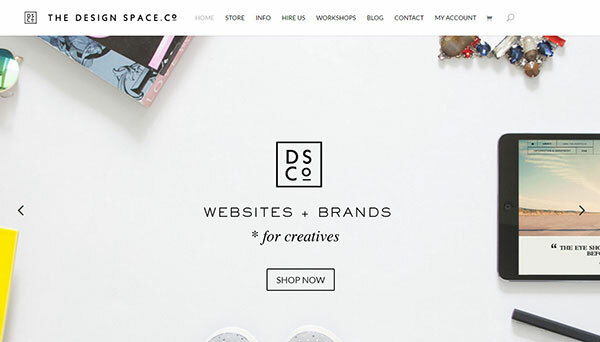 The Design Space Co blog is also worth checking out. Based in New Jersey but serving the world, Viva Design Studio uses Divi to create websites for clients across a range of industries. Since deciding to become a Divi-exclusive shop back in 2014, Kathy Kroll Romana of Viva Design Studio hasn’t looked back. Although Kathy has a programming background, Divi allows her to skip past most of the coding stages of a new project and really focus on the design and user experience of her clients’ websites. The websites in the Viva Design Studio portfolio have all been created with Divi and make use of a wide range this theme’s features. This includes the popular full-screen module, buttons, calls to action, the Divi Library, and even some of the new Divi 100 features. Sunflower Creatives produces websites for clients that help them get the attention and leads they deserve. All projects are completed using the Divi theme, and in addition to custom web design services, there are a number of commercial Divi child themes available at the Sunflower Child Themes website. 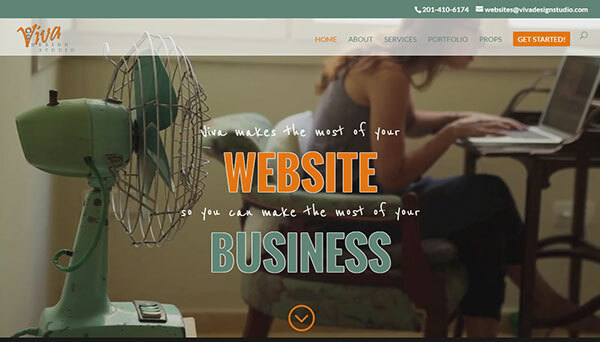 Tammy Grant at Sunflower Creatives has really embraced Divi and its many features. This means she now works smarter, not harder, and can deliver better projects for her clients. As part of her workflow, Tammy uses the Divi Library to save elements and pages for reuse throughout projects. Divi also makes it easier for clients to choose which design option they prefer from a range of choices. The drag-and-drop interface of Divi Builder now makes fulfilling client requests, such as changing the order of sections on a page, a breeze. Sunflower Creatives is a great example of a diversified online business built around Divi, with both bespoke services and off-the-shelf products available to their clients. Rebecca Lutz has found her niche in the world of web design and has created some impressive websites for coaches across a range of disciplines. Divi helps Rebecca create effective websites for her clients in just one week, and judging by the feedback she’s received from her clients, that is plenty of time to deliver a successful project. Rebecca is all about helping her clients attract more clients, whether that’s through her Website in a Week Workshop, her bespoke website design services, or simply with the content on her blog — and Divi plays a key part in making that happen. Through his agency GruffyGoat, Nathan Duvall offers everything needed to get a website online, from design and development to hosting and ongoing support. Nathan started using Divi for client projects about two years ago and has been using it ever since. The ease with which any design or layout can be created has kept him loyal to Divi, moving away from working with an assortment of different themes for different types of projects. Being able to save layouts and elements to the library for later use has helped speed up the GruffyGoat workflow considerably, making GruffyGoat one of the most productive Divi agencies around. Nathan reports that clients are extra happy with the finished projects, thanks to the ease with which they can use Divi to update their websites themselves. Further demonstrating the potential of Divi, Nathan has also been busy creating premium child themes through his Elegant Child Themes business. This all helps to make this another one of the Divi agencies that are helping to empower Divi users with off-the-shelf designs. Compiling this article of Divi agencies has been a real revelation. I’ve always found it fascinating to learn how other freelancers work, and even within one sub-niche of the web design industry, this collection of Divi agencies has demonstrated that there’s great variety on display, in terms of both workflows and the finished projects. Once I started looking for web design agencies and freelancers that only or mainly used Divi to promote their business and create sites for clients, I kept finding more and more. This collection of Divi agencies could have included many more great portfolios but I had to stop somewhere. However, if I missed you, please share your work in the comments below. Special thanks to all of the Divi agencies who shared their work and responded to my emails! Do you create websites for clients with Divi or know of someone who does? Please share your portfolio or links to other Divi agencies in the comments below. 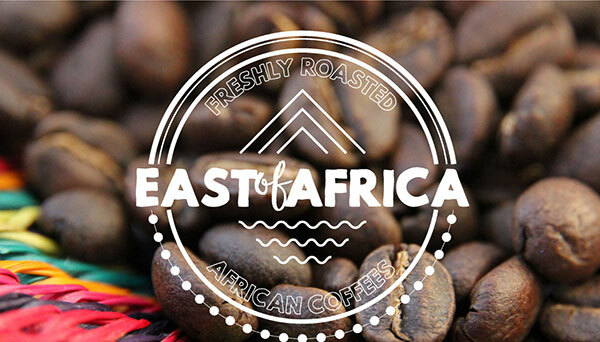 Also, be sure to subscribe to our email newsletter and YouTube channel so that you never miss a big announcement, useful tip, or Divi freebie! Only A Girl and Her Mac has that extra different look compared to all the other sites listed. Yes, it does have a different look to the others. Thanks for including Aspen Grove Studios among group of talented agencies, Joe! Impressive use of Divi by the agencies, designers, and freelancers listed above! It is definitely a professional goal of mine to be included on such a list in the future. Very beautiful and useful website ! Great showcase for DIVI and their Pro-users. The creations in flexibel variations gives wonderful impressions. Compose talent(s) and the use of DIVI creates so many great sites. The combination of personal motivation into text and illustrations or photos makes every presentation one of a kind. In my experience is DIVI the tool to think great and perform on a pro-level. I love it, great sites. Delighted to be included. Thanks so much! Great article, and I’m proud to call the majority of these folks good friends. We also do primarily Divi work at Undeniable. Thanks for the focus on this topic, Joe! I agree with other commenters that for the most part, these sites are not great examples of, or unique website designs. However, I definitely am not casting aspersions, as my site is neither of those things. One thing I can say after looking deeper into some of the sites listed, they do a lot of things right. Great calls to action, creative use of text/fonts (Sunflower Creatives and others), the budget link in the menu at Divi Dojo, Web Packages with demos by A Girl and Her Mac. 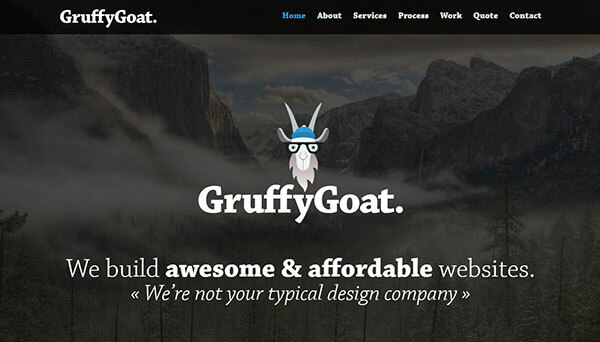 Leumesin Design’s approach to pricing and services was quite interesting, Fig Tree Design Studio definitely excels at simplicity, as does Gruffy Goat. This is a great post, and there is a lot that can be learned not just from the design of these sites, but the different ways they offer similar services. Thanks for the excellent post Joe, a lot of food for thought here. Thanks James. I was aiming to showcase the work of the agencies and the websites they’ve created for clients with Divi, rather than just the agencies themselves. 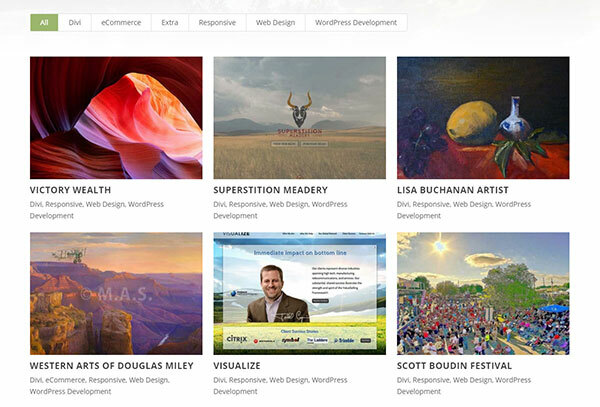 I thought the portfolios did include some websites that look slightly similar – as can often the case with WordPress – but they also include many that don’t. The whole exercise was very interesting as, like you say, reading about different people’s pricing details, onboarding strategies, etc, is very illuminating. Some amazing uses of Divi here! I’m a freelance digital marketer/web developer and made my site with it (becomeknown.co.uk). We are not completely finished yet, but our own website is also pretty representative for the usage of the wonderful DIVI theme. If you’re looking for a 15th, our agency, SEO Skyrocket, has built 51 websites on Divi (or Extra) and has a 52nd under construction (our own). We’re incredibly thankful for Divi and are LOVING the updates as they roll out! Thanks, Elegant Themes! Thanks Chad, that’s a great looking website. Thanks Maribel, looks like you’ve worked on some interesting projects. Great article Joe! I love to read about how other agencies build their businesses. Thank you for adding Sunflower Creatives to this list of agencies. Thank you very much for including DiviDojo in the mix!!! Can’t say enough great things about Divi and how in can be used in so many ways! May be I’ll joined & buy DIVI. I run my business with other wp theme, may be I using divi theme. Thanks for including me .. really appreciate it! Interesting comments here, and yes, I agree that whilst I (and others) don’t have a startling or different design/s, I do design for my market, and really, the overall goal of any freelancer or agency is to attract clients, so sometimes that means not being so edgy that we scare people off! And by ‘people’, I mean the local small businesses who I love to work with. So, there’s often a trade off between design and function, and I’d much rather work with my clients on a site that helps them hit their goals and build their business. I’m guessing I may not be the only one in this list who is in mid redesign of their own site. For most of us, we built our sites a year or two ago and have been working on the jobs in our portfolio’s rather than our own sites. This post wasn’t about the ‘best designer sites’, but rather about people using Divi for their client sites. So don’t forget to check out the portfolio’s too. Yes that is right Sarah. Also, I know what you mean about portfolio re-designs. The design of my writing portfolio hasn’t been updated for many years and is looking really out of date – been too busy working! What an awesome list of very inspirational designers/developers using DIVI for their own and their client’s websites. I can only aspire to emulate them with my own DIVI projects! I particularly like the cool and quirky design and attitude of “A girl and her Mac”, which just goes to show that with a bit of time and effort we can all build great looking websites! I’m sure that I’ll be looking through many of the listed sites over and over for ideas and tips. We’re doing exactly the same as Chad shortly as our portfolio just does not do our Divi sites justice…in fact there aren’t many on there considering we’ve created around 20 or so with about another 10 about to be launched soon. Divi is making our lives busy, which we are so thankful for! Thanks for sharing these great examples of Divi! Always fascinating to see how others are using this powerful theme. Our studio DOERS from sunny Singapore has been using Elegant Themes since we began 4 years ago and now use Divi for a lot of our web projects. It has really empowered us and I am sure many other designers to create awesome websites for our clients. Counting down to Divi 3 =)! I loved using divi to build my portfolio site. Makes web work work a lot easier when I don’t have to focus on the major coding! Thanks for the ad Joe! Great post. Thank you for including VDS, Joe! (Sorry for the late check-in, I’ve been on holiday.) It was very interesting to read about how different designers have adopted Divi for their business and made it their own. Every designer has a unique style and approach, and I think each of us has made the most of what Divi has to offer. Divi changed my entire business model, allowing me to work more efficiently and productively. And it just gets better and better. Looking forward to 3.0! Very nice article. Freelancer here and very new to Divi. My agency does web design. After looking at the various sites here, we’ll probably use Divi on most of our projects. The look is clean and symmetrical. I’ve just refreshed my photography site thanks to The Design Co and their Skye template. With help from Melissa the issue of formatting of the site for landscape iPad and laptop screens was addressed. Her help was invaluable – truly amazing support! The divi blog and support also means I have control of my site going forward – I couldn’t be happier as my clients love the new look too!! I also have been using Divi for all my WordPress clients. We’re Divi fans and use it for all our sites too, check ’em out here http://bitpalette.com. Impressive developments, it just makes me think that with ET there are no limits on the imagination to design, which only makes me inspire me to improve every day more, thank you for sharing! I love the designs of the websites using Divi. Very inspirational with the abilities of the designers to use Divi and run with it. I am trying to create Request a Quote page like https://gruffygoat.com/request-a-quote/ . What I mean is the form not the header, navigation etc. Any pointers, resources or links to tutorials on how I can accomplish it? Appreciate it.